Luke and Andi’s relationship has overcome considerable odds already but, when life takes them in separate directions, they’ll face new hurdles. They’ll be forced to decide if absence really does make the heart grow fonder - or if it just makes it easier to move on. A.D. Justice's debut novel is Wicked Games, A Steele Security Novel. It is the first of a five book series. The second book in the Steele Security Series is Wicked Ties. it continues the story exactly where Wicked Games ends. Each book is designed as a stand-alone from a character perspective, but reading from the beginning will give the reader a better sense of how the characters are connected. The premise of the series is based on a group of elite soldiers and their adventures with Steele Security. 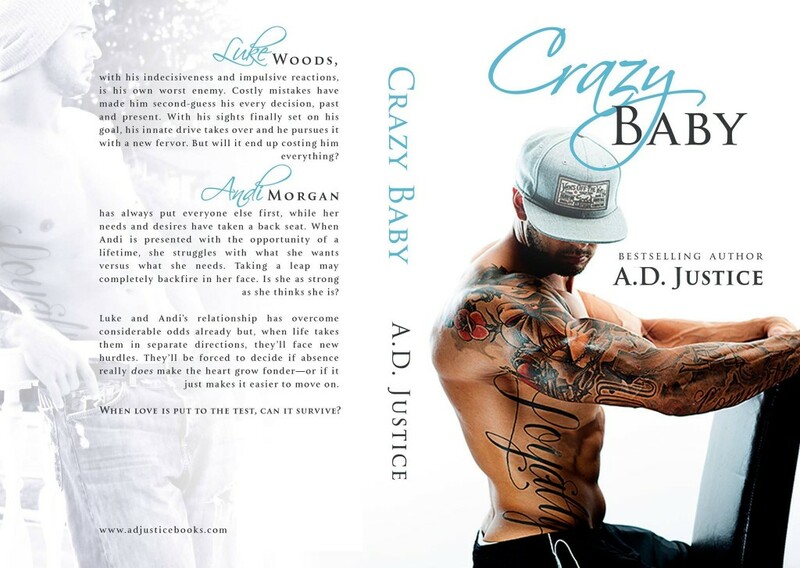 A.D.'s second series is the Crazy Series and Crazy Maybe is the first book. It is not for the faint of heart - complex, real-life issues are addressed, with several twists and turns that will keep you turning the pages until you've devoured the whole book! This series will also continue with more emphasis on the supporting characters. The third series is Dominic Powers. Her Dom and Her Dom's Lesson are both now available. This series gives a fresh, new, and realistic look at how a Dom/sub relationship really is, with the addition of a few twists, turns, mystery and intrigue. A.D. Justice has been married for 25 years and has two wonderful sons in college. She is also an avid reader of romance novels and, to her amazement, a self-published author. A.D. enjoys reading many different types of romance books - including drama and suspense, crime and mystery, NA and YA, and contemporary and erotica.